This kind of scenario happens all the time. Go back to 1997 for a minute. The Minnesota Twins dealt All-Star second baseman Chuck Knoblauch to the New York Yankees for Christian Guzman, Eric Milton, Danny Mota and Brian Buchanan. Eric Milton, who was an All-Star and pitched a no-hitter for the Twins, was traded to Philadelphia for Carlos Gomez and Nick Punto. Brian Buchanan was traded to the San Diego Padres for Jason Bartlett, who was then sent to Tampa Bay for Delmon Young and Brendan Harris. Therefore, theoretically, Chuck Knoblauch was traded for current Twins Nick Punto, Delmon Young, and Brendan Harris. It doesn't look like the Twins gave Johan Santana away after all. Two years after trading the two-time Cy Young award winner to the New York Mets for Carlos Gomez, Phil Humber, Deolis Guerra, and Kevin Mulvey, the pieces are starting to come together. Too bad none of the pieces are the players listed above. Of the four players acquired in the Santana deal, only Guerra is still in the organization, pitching for the Class-AA New Britian Rock Cats. The speedy Carlos Gomez was sent to Milwaukee for JJ Hardy, who now starts at shortstop for the Twins. Kevin Mulvey was sent to Arizona for Jon Rauch, who is now the Twins closer. Phil Humber was designated for assignment, and is now in the Kansas City organization. Gomez never reached his potential, batting .248 with 130 runs scored during his two seasons with the Twins. Gomez went from starting centerfielder to a pinch runner and defensive replacement in the late innings. Hardy, whom the Twins traded for during the New York Yankees World Championship parade, is batting .267 with two home runs and six RBI through eleven games. He also has a 1.000 fielding percentage and has assisted in six double plays. In the two games Kevin Mulvey appeared in a Twins uniform, he had a combined ERA of 27.00. He was traded to Arizona last season for RP Jon Rauch. 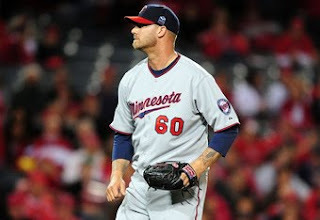 Rauch went 5-1 with a 1.72 ERA for the Twins in 2009, and has now stepped into the closer role with Joe Nathan missing the season due to elbow surgery. Rauch is 6/6 in save opportunities and has an ERA of 1.50.